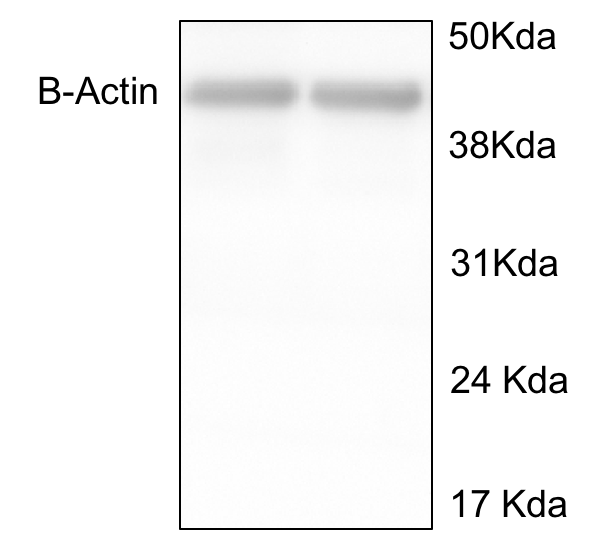 Mouse monoclonal beta Actin antibody [AC-15] conjugated to HRP. Validated in WB and tested in Mouse, Rat, Sheep, Rabbit, Chicken, Guinea pig, Hamster, Cow, Cat, Dog, Human, Pig, Carp, Monkey. Synthetic peptide corresponding to beta Actin (N terminal) conjugated to keyhole limpet haemocyanin. Our Abpromise guarantee covers the use of ab49900 in the following tested applications. WB 1/25000 - 1/50000. Predicted molecular weight: 42 kDa. 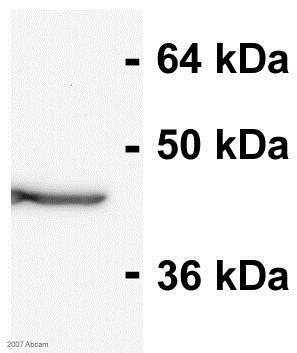 Western blot - Anti-beta Actin antibody [AC-15] (HRP) (ab49900)Image from PLoS One. 2010 Aug 25;5(8):e12400. Fig 8, doi: 10.1371/journal.pone.0012400. Proteins were loaded onto a 10% SDS-polyacrylamide gel. 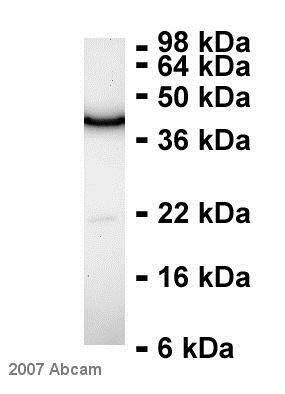 After gel electrophoresis, blots were subsequently probed with primary antibodies anti- IL-6 at 1:1000 (ab6672), anti- IL-17 at 1:3000, anti-TGF-β at 1:1000 (ab66043). 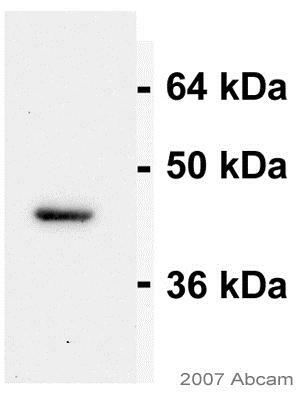 For detection, horseradish peroxidase-conjugated secondary anti-rabbit antibody was used followed by enhanced chemiluminescence development. 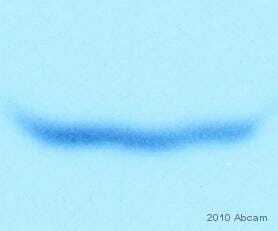 Normalization of results was ensured by running parallel western blots with β-actin antibody at 1:25,000 (ab49900). The optical density was quantified using an image densitometer. The data are presented as a percentage of target protein relative to β-actin. A value of p<0.05 is considered significant. Blocking Step: 5% Milk for 1 hour at 22°C. Publishing research using ab49900? Please let us know so that we can cite the reference in this datasheet.